We are committed to the conservation of the unique plants of the Umpqua Valley as well as the beautiful plants of our region. 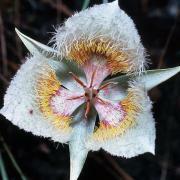 Calochortus coxii or Cox's Mariposa Lily is a serpentine endemic occuring in only 8 known locations in the southern Umpqua Valley around Myrtle Creek and Riddle. Named for Marvin Cox a past member of the Umpqua Valley Chapter of the NPSO. 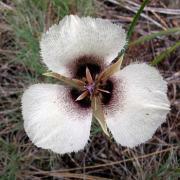 Calochortus umpquaensis or Umpqua Mariposa Lily is a serpentine endemic found growing in dry serpentine meadows in the little river area in eastern Douglas County. Arabis koehleri var koehleri or Koehler's Rock Cress is unique to the Roseburg and Winchester area on rocky outcrops. Plagiobothrys hirtus or Rough Popcorn Flower is unique to the Sutherlin area in vernal ponds. Kalmiopsis fragrans or Fragrant Kalmiopsis is unique to the Umpqua Valley and is one of only two species in the genus Kalmiopsis. 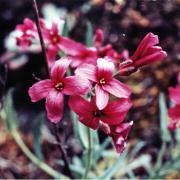 The other species in the genus Kalmiopsis leachiana is endemic to the Siskiyou Mountains just south of Douglas County.